Harold Brownlow Martin was universally known throughout his long RAF career by his nickname ‘Mick’. He was born in the Sydney suburb of Edgecliff, Australia on 27 February 1918, the son of Dr Joseph Martin and his wife Colina. He went to Randwick High School, Sydney Grammar School and Lyndfield College. Before the war, Martin seemed destined for the medical profession like his father. In 1939 he had accepted a place at a medical school in Edinburgh, but shortly after he arrived in Britain his intentions were overtaken by the outbreak of war. He first joined the Australian army, but then in 1940, he transferred to the RAF, and began pilot training. He qualified as a pilot in June 1941, and his first operational posting came in October, when he was sent to 455 (Australia) Squadron, an RAAF outfit flying Hampdens. Two of his regular crew came to include fellow Australians Jack Leggo as navigator and Toby Foxlee as wireless operator/gunner. I said: ‘I flew with a Pilot Officer who told me his name was Martin … a Sergeant Foxlee told me that I was in his crew.’ The Flight Lieutenant then said ‘Well, there’s not much hope for you if that’s the case because Martin is as mad as a grasshopper; he likes flying his own style.’(Tom Simpson, Lower than Low, Libra Books, 1995, p40. The crew went on a further dozen operations together until, in April 1942, 455 Squadron were transferred to Coastal Command. Martin, Leggo, Foxlee and Simpson then moved to 50 Squadron in order to continue their tour in Bomber Command. 50 Squadron was flying Manchesters at the time, but was in the process of moving over to the more powerful Lancasters. Three more Australians (Plt Off Burton, Sgt Paton and Sgt Smith) joined the Martin crew on their first 50 Squadron sortie, the Thousand Bomber raid which attacked Cologne on 30 May 1942. They thereby became the first ever all-Australian crew to fly a Manchester operationally. It must have been at the investiture ceremony for this DFC that Martin first met Guy Gibson. It is recorded that it was there that they had a conversation about low flying methods. A few months later, Martin was just coming to the end of a spell as an instructor in 1654 Conversion Unit at Wigsley. Gibson recalled the earlier conversation and was quick to recruit him for the new project. Martin set about bringing back together a crew mainly based on old 50 Squadron comrades, with a New Zealander from 75 Squadron, Len Chambers, as wireless operator. He also seems to have been instrumental in bringing in other men to the new squadron, often other comrades from 50 Squadron. On the Dams Raid, Martin lined up to attack the Möhne Dam just minutes after disaster had overtaken Hopgood. Gibson joined his attack, flying slightly ahead on his starboard side. This tactic seemed to distract the dam’s gunners and Martin was able to drop his mine correctly. However, something must have gone wrong as the mine veered off to the left and exploded some 20 yards short. Later, as both Young and Maltby attacked, Martin joined Gibson in diversionary tactics, putting himself at further risk. Luckily, although one of his fuel tanks was damaged it had already been emptied, and he was able to fly back to Scampton when the Möhne was breached. After the Dams Raid, Martin was a key figure in many of the celebrations and at the investiture in London, where he received the DSO. The Australian press and broadcasters were very keen to have pictures of their boys shown back at home, and with his distinctive moustache Martin was often recognised. In September 1943, Martin was acting CO of 617 Squadron in the unhappy circumstances following the catastrophic attack on the Dortmund Ems canal when six pilots and most of their crews were lost in two days. Strangely, this was the only period during the war when he took command of a squadron. Later, when Leonard Cheshire arrived, Martin participated in attacks on targets in France, Italy and Germany. In February 1944, during an abortive attack on the Antheor Viaduct in the French Riviera, Martin’s Lancaster was hit by ground fire, killing the bomb aimer Bob Hay, and causing Martin to force land his crippled aircraft in Sardinia. This was Martin’s forty-ninth (and last) heavy bomber operation. However he flew another thirty-four operations in Mosquitos in 515 Squadron. Martin stayed on in the RAF after the war, and had a distinguished career. 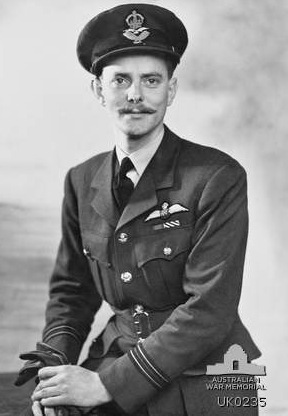 He broke the speed record for flying from England to Cape Town in a Mosquito, and then went on to a succession of staff jobs including being an ADC to the Queen, C-in-C RAF Germany and the Air Member for Personnel. He was knighted and rose to the rank of Air Marshal before retiring in 1974. Martin was described by Ralph Cochrane as being the greatest pilot the RAF produced during the war. (Paul Brickhill, The Dam Busters, Evans 1951, p163.) There would be few who would dispute this view. Martin married his wife Wendy Lawrence in 1944, and they had two daughters. He died in London on 3 November 1988 after complications following a road accident. He is buried in Gunnersbury Cemetery in London. Survived war. Died 3 November 1988. 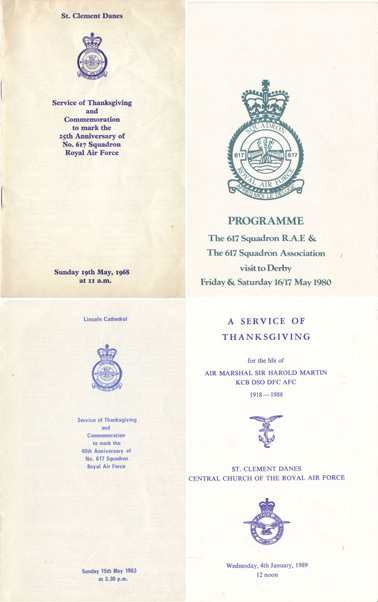 Further information about Mick Martin and the other 132 men who flew on the Dams Raid can be found in my book The Complete Dambusters, published by History Press in 2018. More from the remarkable collection of Dom Howard. You can see these items in full here.